To order Long Distance Services or view pricing information, see the UW-IT Service Catalog. The Long Distance Bill Viewing application provides online delivery of Long Distance Bills in a variety of formats. Bills are available for the most recent billing cycle as well as for previous months. Records will be retained online for six years. An email notification is sent to authorized users when the monthly billing has been created and is available to view on the Web. A follow-on release of the Long Distance Bill Viewer will include Project Cost Accounting (PCA) codes. Many users wonder if they need to ensure that every long distance call is verified, no matter how small the charge (e.g. $0.02 call). Departments are responsible for ensuring that long distance phone calls are related to University business. Departments may set policies that would preclude certain charges (a $0.02 call for example) from individual review. Departments need to have systems in place to ensure that expenditures (including long distance billings) are a valid and appropriate charge to the UW budget and they need to evaluate the risk and cost/benefit for their department when determining what controls to put in place. To begin using Rome applications (Long Distance Services, Long Distance Billing, and Technology Services and Equipment Billing) you need a UW NetID. If you don’t have a UW NetID, learn about Accounts and Passwords on the About UW NetIDs page. Occasionally a security certificate error will show up on the screen at this point. If you receive an error message saying: “There is a problem with this website’s security certificate”, go to Install the UW Services CA Certificate page. and follow the instructions for installing the UW Services Certificate Authority. Try accessing the site again. You must setup the ‘Astra Role of ‘USER’ for this person to have access to the Rome Web pages. You have the option of also granting the role of Authorizer but that only controls the actions that people can do in Astra, not what they can do in the Rome applications. You will see a detailed list of calls for that Bill Year/Month and Budget Number. You can export the data in three different formats: text file, Excel spreadsheet, PDF (showing multiple users per page) or ‘1 auth/page’ PDF (showing each user on a separate page). When you click the “View” link from the Bill Summaries screen, it will take you to the “Bill Viewer” screen and display the billing detail. The Bill Viewer screen has two drop-down lists: one for the bill year/month, and another that contains all of the budget numbers for which you are authorized. If you choose a budget number from the drop-down list on the Bill Viewer screen, it is possible that the budget you choose won’t have any data associated with it and you will get an error that says “no data was found.” To avoid choosing budgets that have no calls associated with them, keep the “Bill Summaries” page open at the same time. Navigate back to the “Bill Summaries” page using the browser’s back button or click “Bill Summaries” under the “Long Distance Billing” menu near the top left of the page. To view the billing detail in another browser tab, use the “right click” on the “View” link on the “Summaries” page and choose “Open in new tab” or “Open in new window” from the pop-up menu. 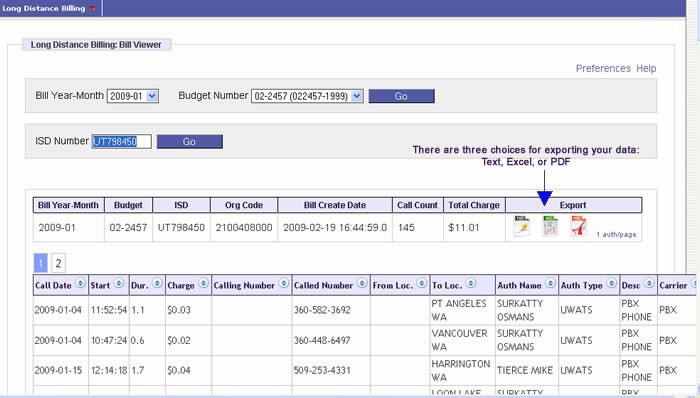 This allows you to keep the Bill Summaries page handy while you are looking at the billing detail for each budget. Some browsers allow you to middle-click the link to open it in a new tab as well. Use the Preferences screen to opt-in or out of receiving email when the new Long Distance Bill is available online. You can also enter an alternate email address to receive notifications, instead of your regular email address. To opt-out, uncheck the Receive Notifications box.